For my third trip to Africa for the McKnight Foundation, I accompanied my friend and colleague Karsten Vennemann. Karsten was funded by the McKnight Foundation to provide GIS support to the Collaborative Crop Research Project (CCRP) for three years, and he hired me to assist. The workshop was held at the African Institute for Capacity Development (AICAD) on the campus of the Jomo Kenyatta University of Agriculture and Technology. The institute covers all the bases--meeting rooms, lodging, and food. As with my previous visits, we used open source GIS software exclusively, primarily QGIS. Unlike previous visits, this workshop was a full week and focused only on GIS--it was not tacked on to a previously scheduled research methods workshop. The attendees came from a variety of government agencies, NGOs, and Universities. We had several students in the workshop as well, and they seemed to show the keenest interest and definitely learned the fastest! Karsten and I divided the teaching duties roughly equally, and tried to give the students a balance of instruction and hands-on exercises. Unfortunately Karsten got really sick the night before our day long session on R (the open source statistical analysis package). I did my best to improvise a session using other materials, but it was difficult without Karsten! Fortunately he recovered by Friday and was able to cover some of the R material in the morning. After teaching all day, I would make a bee line for my room, change out of my formal teaching clothes and into shorts and a t-shirt, grab my camera and binoculars, and head for the fields. JKUAT is located outside of Nairobi, and has extensive agricultural fields and the associated ponds, hedgerows, etc, all of which make excellent bird habitat. On these daily 'bird walks' I would always see a variety of birds, but I would also meet students and locals who were just cutting through the fields. They all thought I was a bit crazy, but they were very friendly and several groups of people asked me to take their picture. I'm not entirely sure why, but I was happy to oblige. 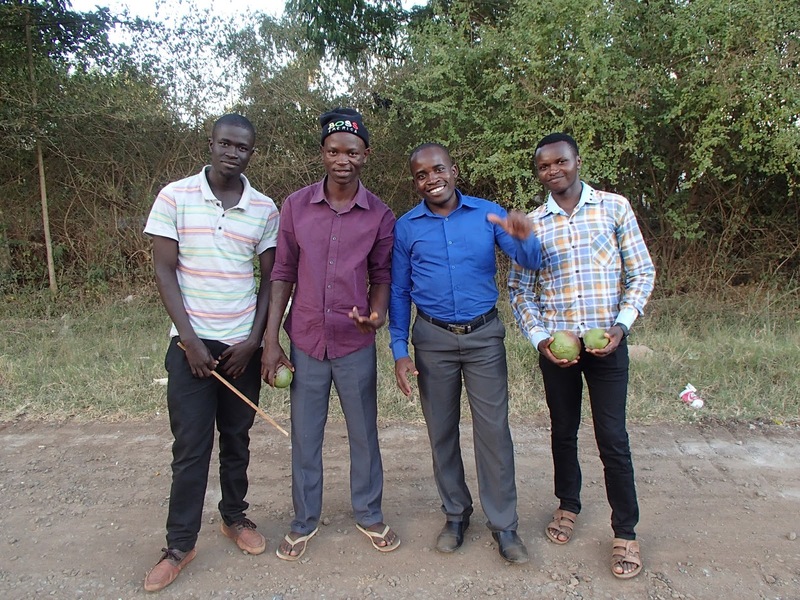 Some of the friendly locals I met on one of my bird walks, they even gave me a mango! After the workshop Karsten and I headed south from Nairobi to Amboseli National Park for a quick safari before heading back to Seattle. This was my third time to Africa for the McKnight project, and on the previous two trips there was little to no time to see the amazing wildlife and landscapes just outside of the cities hosting the workshops. 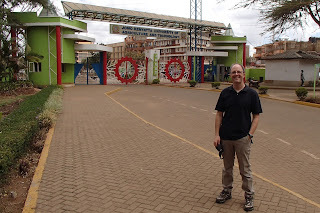 Since Nairobi is surrounded by incredible national parks and reserves, Karsten and I were determined to at least take a couple of days to visit one of the nearby parks. After doing a bit of research, we were able to find a guide who would pick us up at JKUAT, drive us to Amboseli National Park, and act as our safari guide within the park as well. We had a very early departure on the first morning and an uneventful (but long) drive south, nearly to the border with Tanzania. We had a good view of the brand new Chinese-built and Chinese-funded railroad connecting Nairobi and Mobassa. We stayed in a (very posh) tent at the Kibo Safari Camp, just outside the entrance to Amboseli National Park. The scenery and wildlife within and around Amboseli is truly stunning. I've never seen anything like it, and it is hard to describe the feeling of being surrounded by wild elephants, giraffes, hippos, hyenas, lions, antelope, and more bird species than I could possibly identify. So I'll let the pictures tell the story. African fish-eagle, the bird I most wanted to see in Kenya! Elephants in front of Mt. Kilimanjaro. This is one my favorite photos I took on our safari. Still can't believe I was really there!